How to Redeem gThankYou! 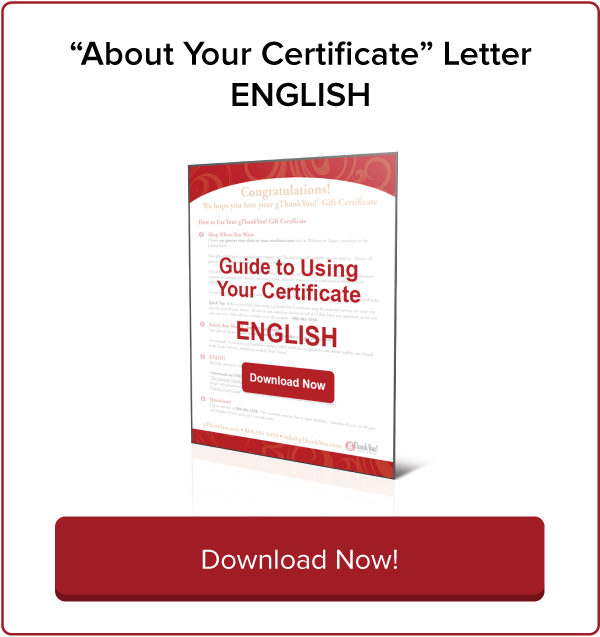 Certificates | Employee Gifts from gThankYou! Choose any chain grocery store that honors manufacturer Coupons anywhere in the United States. Your Gift Certificate is a Manufacturer Coupon, just like the cents-off coupons you’re used to. Almost all grocery stores accept Manufacturer Coupons. The only stores that do not honor gThankYou Gift Certificates are those that do not accept any Manufacturer Coupons, including the club stores Costco and Sam’s, specialty stores such as HoneyBaked Ham and the Aldi chain. We do not recommend discount general Merchandise stores such as Walmart and Target. If your local market store doesn’t accept coupons but wants to honor yours, have them call us and we will help. Quick Tip: If this is your first time using a gThankYou Certificate, visit customer service on your way into the store. Ask customer service to call us if they have any questions so we can take care of it. Our toll-free number is on the coupon 888-484-1658. Your Gift Certificate is good for any brand of merchandise and any preparation. If you have a gThankYou! 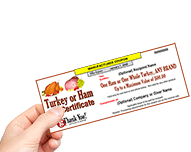 Turkey Gift Certificate, it's good for one whole turkey, any brand and any preparation – fresh, frozen, brined, smoked or even cooked. Your choice! We hope you enjoy your gift with friends and family! Download a free turkey or ham cookbook here.